Each of the 26 veterans in the St. Joe’s program, which is administered through the school’s Haub School of Business, was competitively selected for the program. Once selected, they participate in Phase I, which is a four-week, instructor-led online course. The participants then come to St. Joe’s campus for an intensive, two-week program that culminates in a “Shark Tank”-like exercise called Venture Pitch before a panel of highly-successful business people. Plans for the climbing facility are moving along nicely. Since the EBV program, I have reached out to several community leaders, and I have developed relationships with the regional Small Business Administration office and the Small Business Development Center at the University of Pittsburgh. While the project was initially intended to be a more measured endeavor, after receiving much enthusiasm from the community, I am now adjusting my business plan to accommodate a higher profile facility. Once completed, this facility will be a state-of-the-art indoor climbing and fitness facility in the Pittsburgh, PA metro area, as well as be a modern amenity and community focal point in an underserved area of the country. What did he get out of the EBV program? The knowledge I received and the confidence I developed during the EBV program have already started paying dividends. I have received compliments on my projection of knowledge of the subject and on the conviction with which I present it. 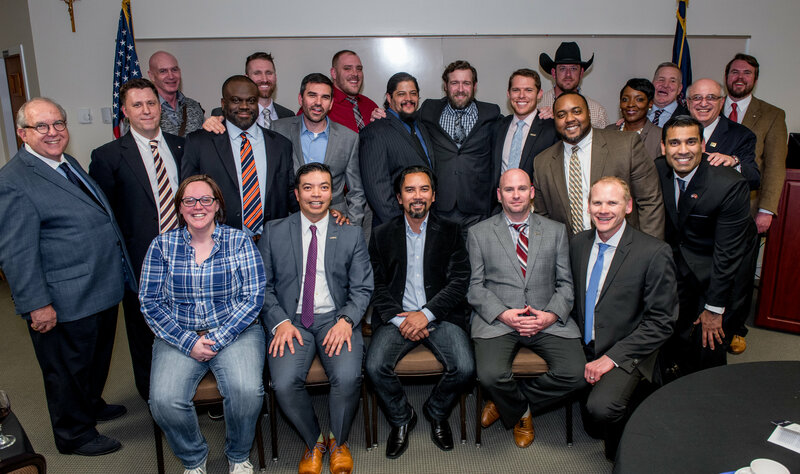 I am very grateful to have had the opportunity to participate in the EBV program and would recommend it to any qualified veteran. The EBV program at St. Joseph’s University was the boost and guidance I needed to motivate me and focus my efforts in this venture. The speaker at the graduation dinner was retired Marine Lt Col Justin Constantine, and I was fortunate to be seated with him and his lovely wife. 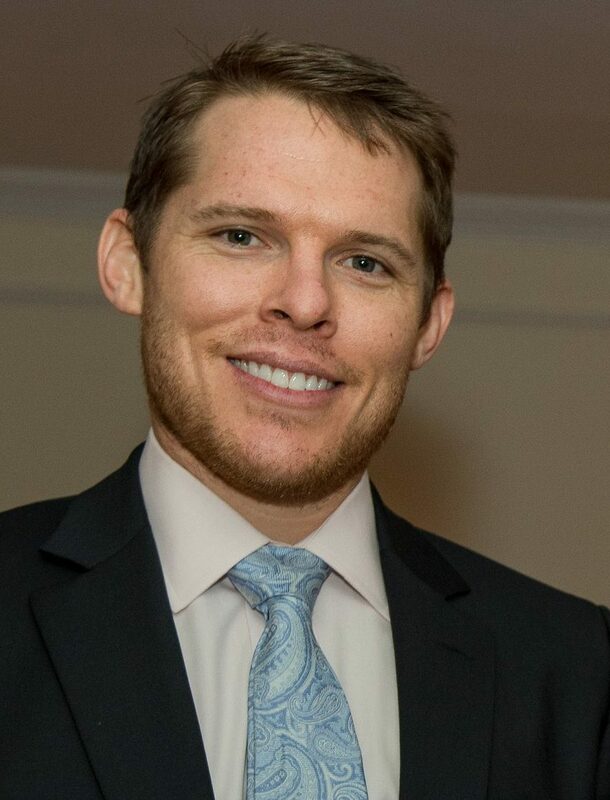 Justin was a judge advocate (JAG) who was serving with a Civil Affairs Team in Iraq when he was shot in the face. He was wounded so terribly that his fellow Marines initially thought he had been killed. Justin’s recovery, which included multiple surgeries to rebuild his face, is a truly inspirational story of perseverance. Among the many points he made was the importance of being willing at times to ask for help, something quite difficult for many people – especially veterans – to do. 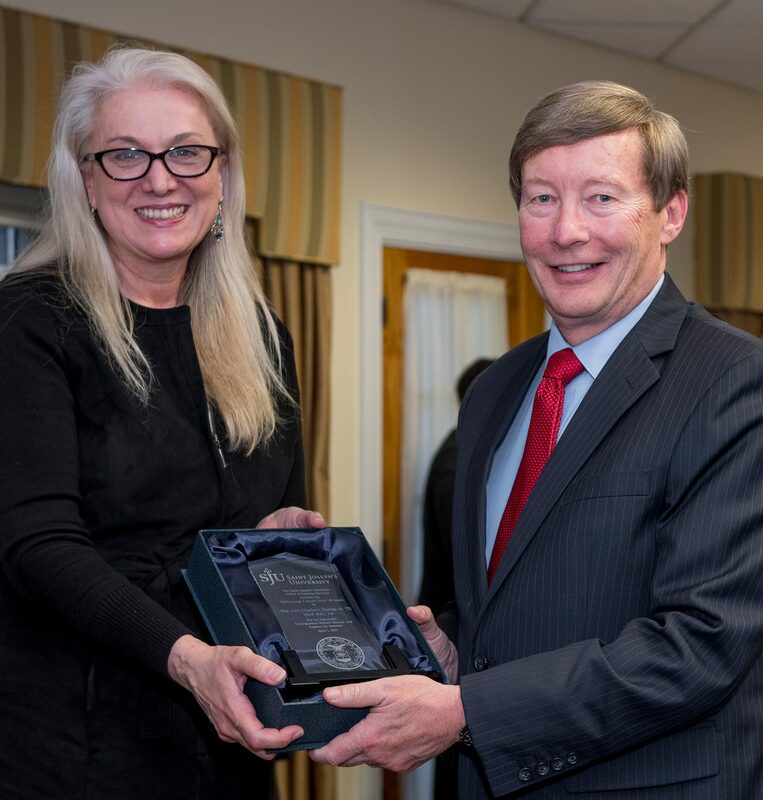 I was honored at the dinner to receive the Dr. George Beichl ’39 Award from the namesake’s daughter. Before becoming a legendary chemistry professor at St. Joe’s, Dr. Beichl was a World War II hero, surviving captivity as a prisoner of war, and earning a Purple Heart along with the Bronze Star. 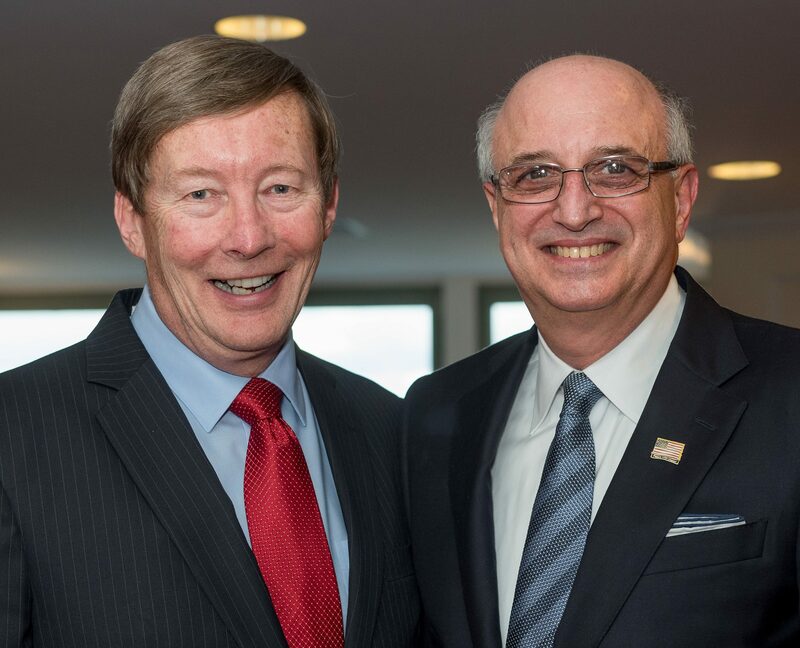 Speaking of heroes, the Office of Veterans Services at St. Joe’s is headed by Ralph Galati, Class of ‘70. Ralph, who was a couple of years ahead of me at St. Joe’s, is a perfect pick for his current job. He brings energy and personableness to the position, and he is not only a veteran, but a highly-decorated recipient of the Silver Star. While serving as an aviator during the Vietnam War, he was shot down and spent 406 days as a captive of North Vietnam before returning with honor. A 28-year career with IBM followed his military service. 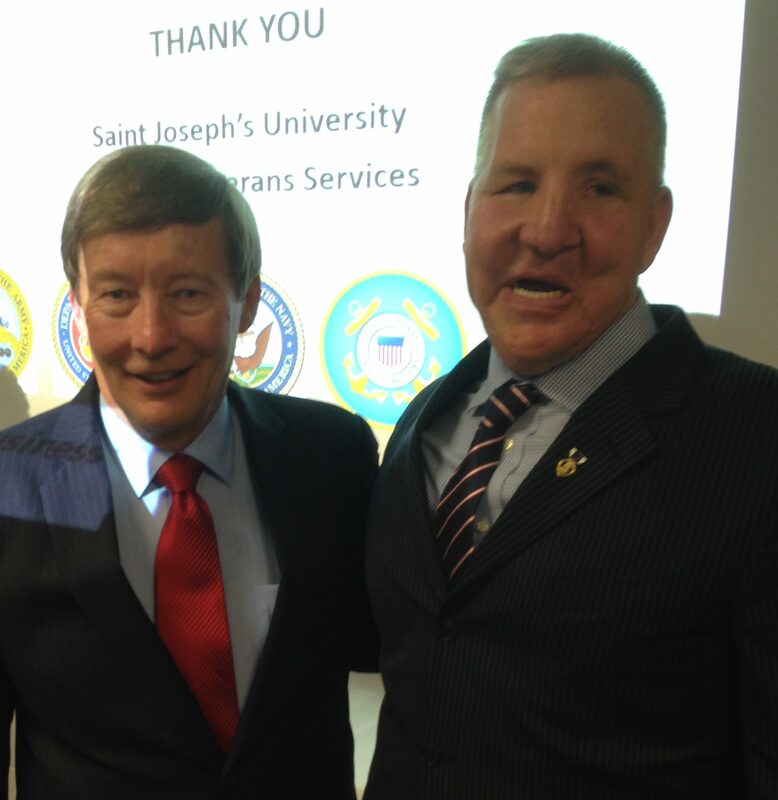 Many schools talk about helping veterans, but St. Joe’s and the other institutions in the EBV consortium are putting action behind the verbiage. They could use more company.